Get in touch with nature at SEA LIFE Bangkok Ocean World and Safari World. For shopping fun, head to Khao San Road or Chatuchak Weekend Market. 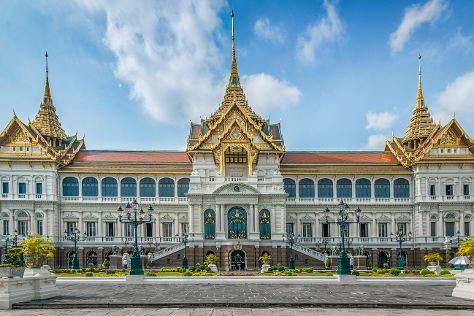 Explore the numerous day-trip ideas around Bangkok: The Royal Golf & Country Club (in Bang Sao Thong), Ayutthaya (Wat Mahathat, Ayutthaya Ruins, & more) and Ancient City (in Samut Prakan). The adventure continues: take in the spiritual surroundings of Temple of the Emerald Buddha (Wat Phra Kaew), contemplate the waterfront views at Chao Phraya River, relax and rejuvenate at some of the top local wellness centers, and buy something for everyone on your list at Siam Paragon. For more things to do, reviews, maps, and other tourist information, go to the Bangkok holiday website . If you are flying in from Malaysia, the closest major airports are Suvarnabhumi Airport, Don Mueang International Airport and U-Tapao International Airport. Expect a daytime high around 40°C in March, and nighttime lows around 30°C. Finish up your sightseeing early on the 5th (Fri) so you can travel back home.